When the National Health Service came into existence in 1946 it was expected to divorce the care of health from questions of personal means and ability to pay. However, the notion of a health service completely free at the point of need, and paid for out of general taxation, never became a complete reality and the purity of the socialist conception of health care was flawed from the beginning. After 1948 NHS doctors were permitted to continue in private practice and charges were introduced for drugs and appliances, dentures and spectacles. For thirty years, however, the private sector in Britain was more of a ‘cottage industry’ than big business. 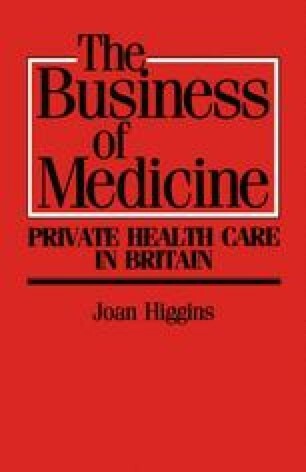 The NHS played a dominant role in the supply, control and financing of health services, and the British system of health care stood in contrast to those of North America and Western Europe where there was a much greater private input to the mix of health services.